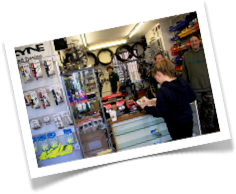 At Emsworth Cycles we have full workshop and servicing facilities to care for your bike. But we don’t just service bikes here; see below for the full range of services that we offer. 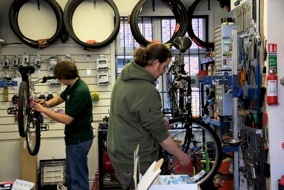 Having your bike serviced regularly will keep it in tip top condition ensuring that you always get a top quality ride and making break downs less likely, therefore helping to prevent expensive repairs and replacements. We recommend a Full Service be carried out every 12 to 18 months depending on use. The full service involves the replacement of the inner and outer brake and gear cables in addition to the Basic Service outlined above, and a fine tune. Approval will be sought from the customer should any other replacement parts be necessary and these will be charged for in addition to the full service cost. We just ask that your bike is in a clean condition when you bring it in for it’s service otherwise there may be a charge involved for removing all excess mud and dirt in order for us to do the best job possible. We are pleased to offer our customers a bike collection service on request. Please contact the store for further details and to discuss your specific requirements. General Maintenance and Repair . . .
We cover a full and comprehensive range of maintenance and repair services carried out by our skilled mechanics, from the simple things such as puncture repairs and accessory fittings right through replacement parts to wheel true and wheel builds. Please contact us to discuss your requirements. We just ask that your bike is in a clean condition when you bring it in for it’s maintenance work otherwise there may be a charge involved for removing all excess mud and dirt in order for us to do the best job possible. Custom Building . . . Ever fancied designing your own bike? We offer a full custom build service. From helping you choose the parts and components most suited to your style of riding, right through to building and finishing your dream bike. All budgets and styles are catered for. Please contact us to discuss your requirements. On the Shop Floor . . .
Getting the right sized bike and/or helmet is very important for both safety and comfort, and is often very daunting, particularly when purchasing for your child. We understand the needs of both those learning to ride a bike as well as the seasoned or professional rider. Call us or drop into the store to arrange your fitting appointment. We have a vast range of bikes at all price levels and are ready to help you find the ride which matches your needs. With having so many bikes, its impossible to keep all of these in store. What we don’t keep in stock we can order and build for you on request. We supply balance bikes, which encourage the learner to develop their balance in preparation for their first pedal bike, children’s bikes, mountain bikes, road bikes, hybrids, tricycles, commuters bikes, BMXs, power assisted cycles, various fold up bikes and many more niches among the growing world of bicycles. With a good range of second hand bikes available, why not pop down and view them in our store. We also accept trade-in bikes and can discuss your individual requirements as necessary. 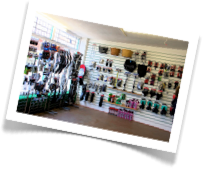 Call into our store to view our range of parts and accessories available to purchase today. For more specific or bespoke requirements we can order anything else that you need on request. Please don’t hesitate to contact us for further information or advice. Probably the most important purchase of all is that of your safety equipment. We recommend all riders wear a cycle helmet, and hold a good stock of lightweight and stylish helmets in store for all the family. We also have hi-viz clothing and a selection of lights and reflectors to give the rider greater visibility when riding on the roads, particularly in poor light conditions. Our friendly, experienced and knowledgeable team are always on hand to answer your questions and queries. Please don’t hesitate to contact us by telephone or email, or call in to the store and we will endeavor to help in any way we can.